August is often considered a slow month in Washington, D.C. Congress is out on recess and many people take the opportunity to leave the sweltering heat for vacation in cooler, less swamp-like parts of the country. However, with our recent office move and plenty of policy developments on the Hill and off, things didn’t slow down much this month for the Government Relations Office. In this month’s E-Bulletin, we link to a new Issue Brief on Section 215 written by Government Relations Committee member Susan Nevelow Mart; summarize the status of Net Neutrality legislation; and review the “Information Sharing Environment” being developed to ease information sharing in the federal government. In addition, we update you on President Obama’s nomination of David S. Ferriero to be the next Archivist of the United States, and include plenty of reading for all of you Information Policy Junkies out there! The Law Library of Congress just made it easier to keep track of the the latest action on the floor of the House and Senate: RSS feeds for the House Floor Today and Senate Floor Today. These new RSS feeds join the other 6 feeds offered by the Law Library, including the Daily Digest that launched in April. Updates are available by RSS or email. This year’s Public Access to Government Information (PAGI) Award winner, The Sunlight Foundation, recently named the three finalists in their “Apps for America 2: The Data.gov Challenge.” Apps for America gives web developers the opportunity to design applications that increase government transparency. This year, all eligible entries were required to use at least one of the data sources or content from Data.gov. 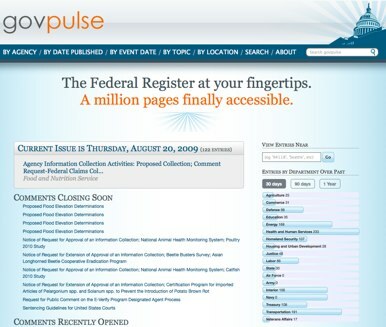 One of the especially interesting finalists is GovPulse, “a Federal Register browser.” GovPulse lets you sort by agency, date published, event date, topic, and location. It also includes a section for “Comments closing soon” and “Comments recently opened.” This app offers many interesting visualization possibilities, so if you’re interested, you might want to spend a few minutes playing with the options! The other finalists are ThisWeKnow and DataMasher. ThisWeKnow organizes and ranks information that the federal government has about your community, such as areas with the least toxins or highest unemployment. DataMasher allows you to take two different public data sources and mash them up. Sunlight Labs blogger Clay’s favorite is People per US Representative. You can vote for your favorite application by registering for a Sunlight Labs account and casting your ballot. The AALL Government Relations Office Has Moved! As AALL President Cathy Lemann announced in her first E-newsletter today, the AALL Government Relations Office has a new address. After many wonderful years in the Edward Bennett Williams Law Library at the Georgetown University Law Center, we said farewell to our colleagues last week and we’re now settling into our new office space. Located just down the street from the Georgetown University Law Library and steps away from Union Station and Capitol Hill, we are subleasing our new offices from the National Association of Counties (NACo). We thank our friends at the Georgetown University Law Library for the memorable years we shared, and we’re enjoying getting to know our new colleagues at NACo. We look forward to hearing from you at our new address. As always, please feel free to contact us at any time. You are currently browsing the AALL's Washington Blawg blog archives for August, 2009.